The Romance Cover: Friday Frights ~ PNR Reviews ~ No Ifs, Ands, or Bears About It (Grayslake Book 1) by Celia Kyle. 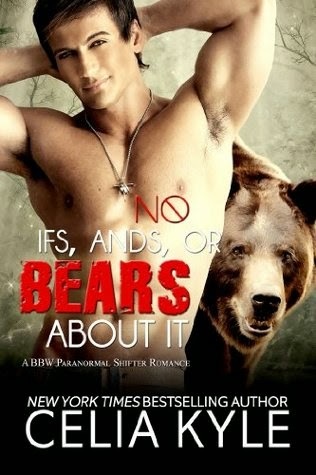 Friday Frights ~ PNR Reviews ~ No Ifs, Ands, or Bears About It (Grayslake Book 1) by Celia Kyle. What I liked about this book was the endearing quality about it. It is about two people, Mia and Ty, coming together. One very sure about his feelings virtually from the get go and Mia not so sure but she had to admit he was gorgeous. Ty was determined, in his eyes Mia was his and his slow seduction on her was beautiful to read. The story begins with Mia coming to Grayslake, Georgia. She had been left a house by her grandfather on his death. On arriving at the house and going through all the boxes left by the removal company, Mia hears a noise in her kitchen and when she went to investigate, she found a very frightened bear cub. It was instant love and all a mothers protectiveness rose to the fore in Mia. This is when Mia first meets Ty, him being the local sheriff, but also he was the head of the local were community, the Itan. Mia, only having a bit of were blood in her had quite the fight on her hands in being able to keep the cub especially when the cubs uncle came banging on her door, raising merry hell being a drunk and very nasty with it. This is why Ty was called out to her address. Ty on seeing Mia was immediately attracted to her and was doing his best to placate her but knew it was going to be difficult for her as she was classed as human in many of the eyes of the town. Managing to get Mia and the cub back to the weres den, Ty starts to slowly work his magic on Mia because in his eyes she was definitely "Mine". He slowly wore her down and Mia couldn't deny what she felt for Ty, having him around her so much to say she liked him was an understatement and he could certainly bring out strong feelings inside of her. The story tells you about Mia’s fight against the odds, with really nasty characters working against her in the background, but it also tells you of the beautiful blossoming relationship between Mia and Ty. I loved this book. It is really lovely to read about a growing romance which is slightly done in the old fashioned way. Ms Kyle I will be following up on the Grayslake series that's for sure.